Many economists argue that government spending on people should not be contracting when the economy needs stimulation . Failing to invest in people - especially through investments like good quality early childhood education and child care - is bad economics. 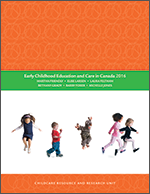 The evidence shows that universal community-based systems of high quality early childhood education and care (ECEC) are part of the backbone of strong economies: ECEC has short-term, medium-term and long-term economic and social impacts on children, their parents, the labourforce, local economies and the larger economy. The benefits of accessible, good quality early childhood education are far-reaching. The following BRIEFing Note discusses the economic benefits, including competitiveness; economic and social returns; keeping families out of poverty; women's workforce participation, education and training; strengthening of local economies; and, combating a diminishing labour force.